You want to make money. But a question in your mind irritates you time and again: ‘Can I make money blogging?’ Once you try to answer this question, another question pops up in your brain: ‘How will I earn from my blog?’ Well, dear reader, you will be amazed after reading this blog as this blog contains simple and experimented solutions for your queries. Examples here will add more to your knowledge. Also, find what famous bloggers say about monetizing a blog. A blog is a creative content which consists of relevant information presented online for the readers. It is a medium between you and your reader. In a blog, you have to define everything that seems significant to your reader. Also, good content carries uniqueness and usefulness. You can be a good blogger if providing solutions to your readers interests you. In other words, your blog is a podium for other products, services or businesses that can help you to make money. Remember one thing that though earning money is not a child’s play but you have to keep faith in yourself and walk with time. Keep yourself agile, creative and thoughtful. 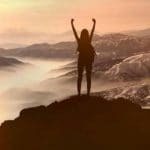 ‘Things may take time, but with the persistent endeavor, results can amuse you.’ Here in this blog 7 simple and experimented ways are presented for you to earn from a blog. Above all, you are the only person who has the capability to monetize your blog. Hence, try implementing these ways. The very first step towards earning from a blog is by hosting your own blog. You can do this by owning a platform on WordPress.com or Google Blogger. If you have the knowledge to create your own website or you have a capable friend, then creating your site will be like sugar icing on a sweet. You can then own a domain name as well. This helps you to connect with your readers easily. Search for topics that interest you and your reader. This helps you to gain more readers and hence more chances to earn. Write on topics on which you have surplus knowledge. Hence, this makes your work little easier as there is no need to research for long hours on such a topic. Every coin has two façades. This means that though it is easier to write on a topic that interests you, it is better to write on a variety of topics to pull more traffic and crowd of readers on your blog. Every reader is different and has different expectations from you. You have to write for all. What next can you do? After hosting your blog yourself and selecting a trending topic, you have a huge responsibility on your shoulders. What’s that? You have to create worthy content for your readers. To build their trust in you this is the most important thing to keep in mind. Provide only relevant and true information in your blog. To create great content for your blog you should research well about the topic before writing. Read and judge whether or not the next point can aid in earning from a blog. After preparing a great content for your blog you should think of ways to monetize it. Increase your social circle on Facebook, Google+ and other social networks. This will help you to know about your future readers or may be customers. Search fervent readers out of your friend list and make a separate list of people who enjoy reading and sharing knowledge. We are doing all this to increase the number of viewers and readers who can contribute their comments or feedback for your blog. This turns out to be very helpful. With the help of their comments, queries or suggestions you can start interacting with them by replying their comments. You can also offer a few readers to write a guest post for your blog if you like their suggestions or the way they share your blog. Check if you can take the next way and step towards your goal. Attract more and more readers to your blog. And try to engage them in your writing for which you must have followed the previous point. For engaging them and making a bond you have to build your presence in their mind. You can comment on their work as well. You can appreciate them, advise them and involve them in your work. Since this bond between a reader and a writer helps you to know more styles of writing and more topics to be discussed. This point is utterly important if you want to earn from your blog as it will be possible only if you have a huge number of readers. Keywords play a very important role in the optimization of your blog on any search engine. These are specific words which are searched by a huge number of internet users. And any search engine if finds these keywords in your blog in appropriate proportion, it will assign a good position to your blog on that engine. Read the final two ways. These are the most important ones. Now you have to use all that you have learned from the above-discussed ways. You have to use your blog and reader power to earn money. Advertise and affiliate marketing of digital products or services on your blog. There are many ad networks like Google AdSense, BlogAds, etc. from where you can search for appropriate advertisements for your blog. The best way as by famous bloggers: You should monetize your blog organically. This means put advertisements related to the topic of a blog you want to post. For example: If you blog about ‘Digital marketing Certification’, then promote certification courses by different institutes and they will pay a commission on every new admission through your blog. These types of promotions are sometimes done on PPC (Pay per Click) basis as well. The world is getting digitized and to monetize your blog, hence, marketing things through advertisements on your blog is definitely going to aid you in making handsome money one day. Now, what does that mean? Earn directly and indirectly! Just read on. You’ll understand. Earning directly means when you directly put advertisements of some commodities, services or other products of a brand on your blog. You may post ads of Amazon products or Snapdeal or any other product from Google AdSense. But you are going to earn the commission directly. An indirect way of earning includes the addition of certain services or products from your side that too on your own blog. You can inform your readers that you are a good consultant or a speaker through your blog. And this will be an indirect medium for you to earn money from your blog. You can even write E-books, prepare videos, small articles, etc. which can be offered to your readers for free at first. And as the number of viewers increases, you can start rating your products and this way earns handsome amounts indirectly. Don’t just read this. Try these ways. They will actually help you. 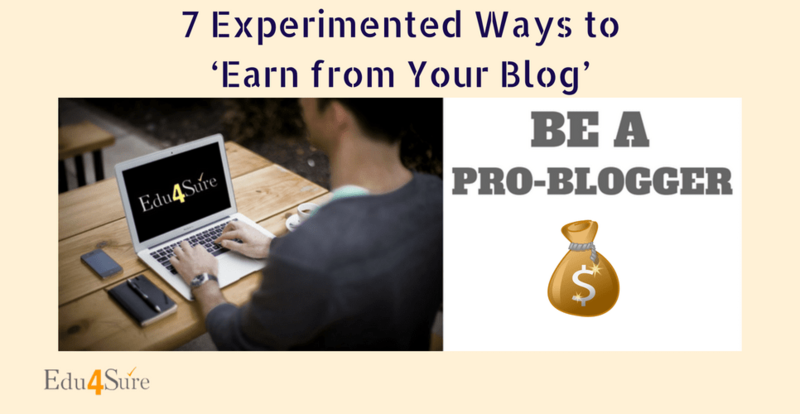 The above discussed 7 ways to earn from a blog are arranged in steps for your easy understanding. After reading thoroughly, you must have set new goals for yourself and your blog. So work harder than before to make money blogging. In addition, your focus should be first on the content of your blog. And then on the methods of monetizing it. ‘Good endeavor always pays back.’ And I hope you must have understood it now. I expect that one day you will start earning handsome money from your blog. Until then, be persistent with your good work. You can leave your queries, suggestions or feedback in the comment box because I am here to help you. I will try to give the best possible solutions for your doubts. So feel free to ask.